We’ve compiled our annual list of office fitness gift ideas. From anti-fatigue standing mats and foot rests to balance boards and standing desk converters, there is an array of products available at every price level to improve the health and wellness of your friends, family, and co-workers. 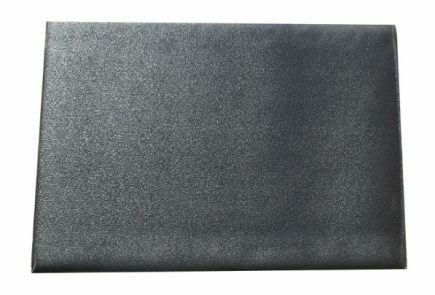 With a unique damage-resistant 100% polyurethane formulation and superior ergonomic design, the EcoLast Premium Standing Mat guarantees a quality standing experience for years to come. A wide assortment of sizes and colors fit any workspace or décor, and unlike cheaply-made department store comfort mats, EcoLast standing mats are firmer, USA-made, NEAT-certified, and come with a ten-year full performance warranty. Read the Top Standing Mat Reviews. A desk converter is a great option for those who don’t want to give up their desks, yet want a stable, ergonomically-sound solution for standing at work. The beauty of a desk converter is that it’s much more portable than a desk, so even if you end up replacing it with a full desk, you can easily move this one to your home or an intrigued friend’s office. The ZipLift+ takes things to the next level with rock solid stability, precision height adjustment, and a tilting keyboard tray that keeps you standing healthfully and productively. Read the iMovR ZipLift+ Sit-Stand Converter Review. Transform your routine with the world’s first compact seated elliptical. Cubii Under Desk Elliptical turns sitting into “active sitting” and is easy on your joints. The Pro and Pro Elite models even come with an app that tracks strides, distance, and calories burned. Simply slide it under your desk or in front of your comfy couch for a whisper quiet workout while you go about your day. Read the Top Desk Cycle Reviews. Getting tangled cables under control can be a headache for all of us. That’s why a dedicated cable management kit is so valuable for maintaining a clean and productive working environment. This basic kit comes with releasable cable ties, magnetic cable guides, adhesive mounting brackets, and a cable sleeve that effortlessly wraps your cables into one bundle. Protect your cables and make it easier to route and guide them in the most inconspicuous way possible, with no need for tools. Watch this video for more details. Scared Sitless offers an antidote to “sitting disease,” the affliction resulting from being sedentary for extended periods of time. This book from Larry Swanson, a massage therapist and personal trainer, approaches sitting disease from a unique perspective. It offers readers insight into muscle aches and pains that can result from poor ergonomic set-ups and provides the proper office fitness behaviors to overcome them. Read the Scared Sitless Book Review. When setting up an ergonomically-sound workstation, don’t forget to add a keyboard tray for a strain-free typing experience. The iMovR Trackless Keyboard Tray installs directly under any desk without a track, fitting in tighter spaces while providing greater stability. It’s easy to install and offers a tilting range up to 10 degrees down or 15 degrees up, for superior comfort. Read the iMovR Trackless Under-Desk Keyboard Tray Review. Adding support for your legs and feet eases pressure on your lower back, making a footrest the perfect addition to any office. With curved support to encourage healthful rocking, the Humanscale FM500 offers a surprising amount of functionality in a simple and elegant package. Rubber, non-skid grips keep your feet in place and protect hard ﬂooring. It’s also backed by a lifetime manufacturer warranty. Read the Humanscale FM500 Foot Machine Footrest Product Review. Aside from increased physical activity, a balance board can help you fight standing fatigue, joint stiffness, and boredom caused by repetitive tasks that don’t require your full concentration. It can be especially beneficial if you’re recovering from an injury or even brain trauma as an enhancement to your physical therapy. The Active Office Board by Fitterfirst is a game-changer for stand-up desk users who want to incorporate extra movement into their work day. While it won’t rival a walking treadmill in energy expenditure, it will help you burn 20% more calories than you would by simply standing still. Read the Fitterfirst Active Office Balance Board Review. Everyone could use some additional space to keep things organized, making the gift of a storage compartment very practical. With its intelligent design and easy-gliding, precision ball-bearing tracks, this Hide-Away Storage Drawer from iMovR works perfectly with most rectangular top sit-stand desks. It comes pre-assembled for easy installation, weighs only 5 lbs, and can be adjusted to act as a dual-purpose keyboard tray. Turn your treadmill desk into a well-equipped and long-lasting active workstation with this 100% silicone lubricant that is formulated to work with all popular brands of walking treadmills. The multi-viscosity blend comes with a “no-mess” nozzle that shoots a straight stream of oil exactly where you want it, never where you don’t. Making it a perfect stocking stuffer for all treadmill users. Read How to Lubricate a Treadmill.